If planning for your baby is giving you sleepless nights worrying about a future of beans on toast and maxed out credit cards, don’t worry. There are always things you can do to make your money go that little bit further. For something so tiny, babies always seem to need lots of stuff. From prams to cots to toys and nappies, the costs will soon mount up, so it pays to do some financial planning. With the new year in full swing, now is a great time to get stuck into tidying up your finances. We’ve created the best cheat sheet to help you save for a baby and to help you manage your maternity pay. Having a lot of debt round your neck can be real pain at the best of times. But when you’re having a new baby and your income is taking a hit left, right and centre, it’s well worth reducing – or if at all possible clearing – any debt as much as you can before your little one arrives. Channel your disposable income into paying a little extra off credit cards and loans, so you can start family life with a cleaner slate. Try and pay off more than just the minimum amount each month if you can. If you do manage to pay off the balance, store your credit cards somewhere where you’re not tempted to spend on them – away from your wallet! If possible, contact the credit card company to close the account and cut up your card. You’ll be amazed how liberating it feels. Of course, if you’re seriously worried about money or have built up debts which have become unmanageable, visit your local Citizens Advice Bureau or call the National Debtline for advice. Having a baby is likely to bring a noticeable drop in income. Maybe you’ll need to cut back your hours or stop work altogether, or simply learn to manage on maternity pay! A good place to start is to group your outgoings into essential and non-essential items. See if you can reduce the cost of essentials like groceries and household bills by shopping around. Consider getting rid of anything you can do without, like magazine subscriptions or club memberships. Understand what you are entitled to. Its a good idea to understand how your maternity pay policy works and also how statutory maternity pay works. 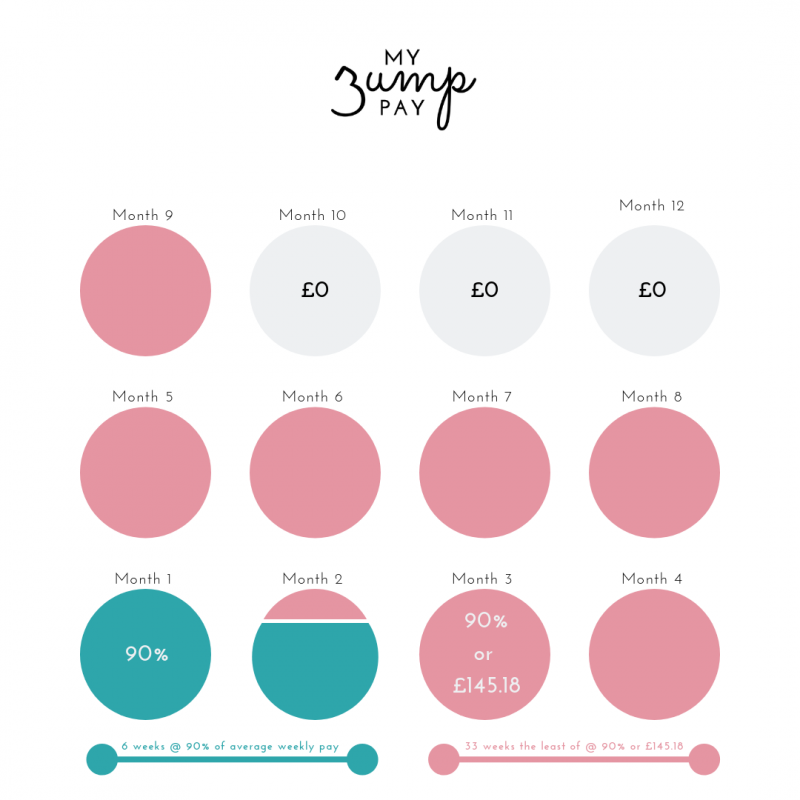 We’ve got a super easy explination of statutory maternity pay below. Also read our guide on 15 things you need to know about statutory maternity pay. Before your baby arrives, spend some time by looking at all your energy providers for things like gas and electricity. Also consider things like your phone contract, internet provider and TV packages to see if you can shop around for a cheaper tariff, or switch companies altogether. Popular price comparison sites include USwitch and Money Supermarket. Babies need plenty of space so why not take the chance to have a good clear out and make some extra cash at the same time? Garages, lofts and spare rooms are always top of the list for hoarding things you just don’t use any more and are great for selling at car-boot sales or on eBay. Gumtree is also ideal for selling things locally with no fees or postal costs to worry about. As soon as you find out you’re pregnant it’s well worth putting a little aside for a rainy day every week. This is especially true if you’re planning to spend the first years of your child’s life working part time or are giving up work entirely. Open a savings account and put away anything you can manage, even if it’s just a few pounds whenever you can manage it. It’ll soon add up. Our budget sheet above can help you plan for a baby, find out exactly how much it could cost to have a baby, to help you figure out how much you need to try to save. Babies tend to bring out wonderful generosity from friends and family alike. Before your baby’s born, as well as in the first few years, you’re likely to have plenty of kindly offers of money or vouchers or people asking if there’s anything you need. Think about the practical things that will help you and your baby get started. If you want to have one, a baby shower is a great way to relax and have fun before the hard work starts, and give your loved ones a chance to bring a gift. If not, why not go for a baby gift list of things which people could contribute to. Consider necessities like nappies, muslin squares and baby clothes. Apart from the car seat and cot mattress, which need to be brand new for safety reasons, most things can be picked up second-hand at NCT sales or on eBay. Now you’re a parent (or about to be!) there’s a whole host of entitlements you can claim from the government which are there to give you a helping hand. Things like free prescriptions and dental care as well as financial benefits are all available and can really make a difference. Obviously everyone’s financial situation is different, so for more information take a look at the Money Advice Service website and see what you can claim. You’ll be glad you did! Keeping in Touch days allow Employees to 10 days during their maternity, adoption or additional paternity leave. These days are typically paid at your full rate of pay. The type of work and days should be agreed with your employer in advace. Sometimes these can be meetings around team updates, changes or client meetings. Find out more about how to use your keeping in touch days here. You may have some unused annual leave in the same year of your maternity leave. While you can’t use annual leave and be on maternity leave at the same time, you may be able to tag it on to the start and end of your maternity to enable you to have some additional paid time off.